A Guide to the Good Life is a modern rehabilitation of ancient Stoic philosophy. It is at once a history and survey of Stoic philosophy and an attempt to adapt it to modern times, trying to answer the question, “How should I live?” I read it when it was first published in 2009 and recently went back to see if it still resonates with me today. I was pleasantly surprised by how much of Stoicism seems a matter of course to me a decade later. Irvine, a professor of philosophy, starts with the premise that to know how to live, we must first identify our grand goal of living—what do we want out of life? Only then we can devise a strategy for attaining it. Otherwise, we won’t have a coherent philosophy of life, and we will be at risk of “misliving”—wasting our one chance at living. This is undoubtedly correct, although determining the goal of living is devilishly hard. I’ve read plenty of philosophy, and I’ve not yet met a convincing account of the meaning of life. You won’t find that here, either. However, if you accept that the Stoics’ goals are worth pursuing, you may find some valuable strategies to help achieve them, as well as methods that may change your outlook rather profoundly. The Stoic school of philosophy was founded in Athens around 300 BC by Zeno of Citium, amid an explosion of interest in philosophy that came in the wake of Socrates’ death. Many schools of philosophy flourished at the time, and parents would send their children to them to learn to live well and acquire the skills of persuasion. The goal of the Greek Stoics was to live virtuously—“in accordance with nature,” as a human being is designed to live. Their philosophy put ethics first but had a strong logical component, as they believed that man’s distinguishing feature is his rationality. A century or so later, Stoicism was exported to Rome, where its followers included the likes of Seneca, Cato the Younger, and the emperor Marcus Aurelius. Roman Stoicism evolved the philosophy to focus on the attainment of tranquility, a psychological state marked by the absence of negative emotions, such as grief, anger, and anxiety, and the presence of positive emotions, such as joy. It is more inwardly-focused than the Greek version. 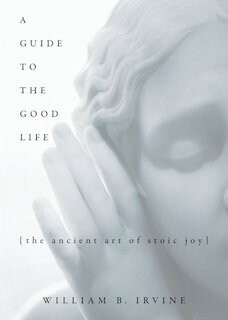 A Guide to the Good Life focuses on Roman Stoicism and the pursuit of tranquility. Note that Stoicism is not an exercise in the repression of emotion, and the Stoics were not stoical in the modern sense (not showing feeling). Irvine emphasizes that the term “joyful Stoic” is not an oxymoron. To appreciate what we have, the Stoics practice negative visualization, contemplating all the bad things that could happen (but haven’t), as well as self-denial, periodically inflicting discomfort on ourselves. These techniques help us overcome our jadedness, want less, and revitalize our capacity for joy. The Stoics also practiced self-reflection, meditating on their actions and motives in order to learn from their mistakes and success—to be better Stoics. It’s remarkable how little the concerns of humans today are from those who lived 2000 years ago. The Stoics were vigorously engaged in social and civic life, and they thought that the primary concern of philosophy should be the art of living. They taught in their school how to respond to insults, how to deal with incompetent servants, how to deal with an angry brother, and how to deal with the loss of a loved one. Not all that much has changed in the dynamics or psychology of these situations. As an introduction to Stoic philosophy, as well as a practical guide to its application in modern life, a Guide to the Good Life is probably your best bet. Irvine does a good job of adapting an ancient philosophy to modern life, presenting the history while updating it to make it feel relevant. He is transparent where he ventures into conjecture or his own personal views. The book could be a bit tighter overall, and I wasn’t much captured by the specific bits of Stoic advise in the third and fourth parts, but perhaps this is because I’ve internalized so much of the core philosophy since I read the book a decade ago. Personally, the Stoic approach appeals to me for much the same reason it appeals to Irvine: it puts our analytical nature to work, leaning into our faculty of reason. Other schools, like Zen Buddhism, also identify desire as a root cause of unhappiness, but their methods are very different. Stoicism is not about emptying the mind, but rather applying the mind to achieve our goals. The Stoic methods are incomplete to my mind—there are complementary practices I lean on, such as Jeff Bezos’s Regret Minimization Framework, and there is much left unsaid here about how to actually approach the many moments of potential joy in your life. Still, the Stoic methods described here are powerful, and I suspect many people would be happier if they incorporated them into their lives in some way.